"Our food celebrates the idea that a meal should combine the simplicity of quality with the complexity of variety." many renowned chefs from Europe, not to mention, locally with Steve Simmons and Joey Altman and Thomas Fife of Tavern on the Green in New York. Liane also owned and operated the infamous Café Tululah in Berkeley from 1997 until 2004. 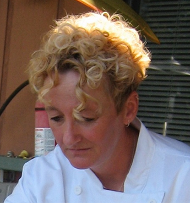 During café Tululah's successful 7-year run Liane won numerous awards and accolades for her inspired cuisine. Local food businesses, street food and fast food Nascent Bay Area food producers say one of the biggest hurdles they face in growing their budding businesses is finding a commercial kitchen to work out of that meets their needs. San Francisco has La Cocina's incubator kitchen, and street eats, underground food folk, and pop-up restaurant types work out of places like La Victoria Bakery, while thriving food enterprises such as Blue Chair Fruit have found a home in the kitchen that houses Grace Street Catering in Oakland. Less well-known is a commercial kitchen work space in Richmond, which gets rave reviews from the emerging and established food companies who work their day and night. The Artisan Kitchen is currently home to two food truck businesses, a few baked goods companies that sell at local farmers' markets and stores, including Guy Birenbaum the French pastry chef behind La Fleur De Lyon, and a gourmet popcorn producer. Tenants, there are around 12-15 at any one time, say the cooperative kitchen space gets high marks for organization, cleanliness, design, layout, light, and equipment -- as well as a communal vibe conducive to getting the job done. The Artisan Kitchen is the brainchild of seasoned chef Liane Ingham, who says she'd worked in her share of substandard kitchens and wanted better for her brethren in the culinary community. "I love the energy and enthusiasm of start-up artisans who want to produce their own recipes and try something new that they're passionate about," says Ingham, who opened the kitchen in 2009. Six months after getting the kitchen up and running she opened a cafe out front because she couldn't find anywhere in the surrounding community to buy healthy, fresh food. The cafe sells seasonal salads, sandwiches, and savory and sweet baked goods made from locally-sourced, organic ingredients, along with Peet's Coffee. Early birds can swing by for free range eggs or oatmeal with blueberries for breakfast. The Artisan Cafe is popular among local business and home-based workers, with its industrial-modern feel, communal tables, and outdoor seating. It's a sunny spot in an otherwise nondescript Marina Bay office park. Ingham runs her own catering company out of the kitchen and says it's been a pleasure to do business in Richmond, with none of the bureaucratic hassles small food companies grumble about in, say, neighboring Berkeley. She notes that since she set up shop new food businesses, such as Galaxy Desserts, have moved in. Her business model (about 60 percent of her income comes from the kitchen, 40 percent from the cafe) has worked so well she's looking to replicate it in Oakland later this year. "Liane chooses the tenants carefully," says Gail Lillian of Liba, who roams around the Bay Area in a lime green truck peddling her popular falafel. "We're all small, boutique-y businesses who work well together and share a sense of integrity in our product." "The moment I stepped into the The Artisan Kitchen, I was instantly charmed by the modern decor and TASTY MENU ITEMS! My mouth was watering."